Yesterday I participated in the launch of OurFairDeal.org a new website home for global citizens coalition around the issue of copyright as it pertains to the internet. The website inherits from the work done by a New Zealand team which put together fairdeal.net.nz/ which is (upon a cursory glance) remarkably similar to the new site. FairDeal.net.nz was launched at the second annual Internet NZ Nethui in 2012, of which the Scoop Media Cartel were proud sponsors. The orginal “A Fair Deal” campaign brought together Internet NZ with a bunch of other groups including the Royal New Zealand Foundation for the Blind, the Creative Freedom Foundation , NZ Rise , Trademe and Kiwiblog‘s David Farrar. OurFairDeal.org takes the NZ based campaigns a giant leap forward bringing together 84 lobby groups from across the Asia Pacific in 6 countries into a global alliance. Together all these organisations are seeking to achieve a fair deal in Global copyright and trade in intellectual property (including branded goods). Since going live last Wednesday the site had (as of yesterday – Monday 20 May NZT) already received 15,000 expressions of support from individuals and organisations. Across the English speaking world there have either been, or are about to be, significant reviews of copyright law. Canada has recently completed a 10 year process and Australia the US & UK and NZ have reviews planned or underway. The genesis for both Fair Deal campaigns is concern over the Trans Pacific Partnership [aka TPP or TPPA ] Asia Pacific regional free trade negotiations. These negotiations are being conducted in secret and affect a wide range of governmental powers. ( You can find out more – visually and satirically – about the TPP (or TPPA) at the ItsOurFuture.org.nz Cartoon Competition which Scoop sponsored last year. The Trans Pacific Partnership is no ordinary free trade discussion and delve into areas which are not normally subject to trade agreements. In the talks pretty much every aspect of Governmental commercial regulation is being negotiated – including the law of commerce and competition, environment, health, finance and investment, intellectual property and of course tariffs. The Fair Deal campaign focuses on the “intellectual property chapter” in these discussions but also concerns some other aspects of the TPP discussions including parallel importing (i.e. the purchase of goods from foreign countries online). 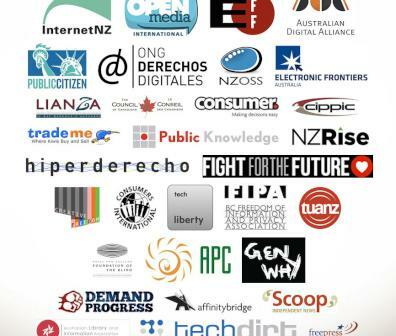 The current TPP intellectual property chapter inherits a lot from the Anti-Counterfeiting_Trade_Agreement ( ACTA ) negotiations (which were also conducted in secret) with shades of the Stop Online Privacy Act ( SOPA ) (which was defeated thanks to concerted opposition during the period of the legislation before the US Congress). It seeks to impose by way of treaty wide ranging and draconian copyright protection laws and extensions which in many people’s views will undermine the utility of the internet. The newly formed Fair Deal Coalition is a very digital native online collaboration. Susan Chalmers ( @susan_chalmers ) is policy lead at Internet. She attended yesterday’s launch remotely via Google + Hangout in Geneva. (She comes on in Part Three of the video below and can be seen holding a phone to her head – the audio quality on the hangout was patchy so we used a voice bridge). Chalmers says the campaign came together in “a very internet manner”. Six early 30’s people from around the Asia Pacific region from a diverse range of organisations each with its own particular angle on the issue of copyright had been collaborating over the TPP issue ensuring that someone was in attendance at each negotiating meeting. This group brought the coalition together. Chalmers says the coalition was able to form because of the simplicity of the key, “agreed positions”. These were contained in the Fair Deal campaign which was launched in NZ last year and are unchanged now for the global coalition. Chalmers says the coalition’s strength comes from its mimicry of the characteristics of the internet. That is, it works via a robust network of people inside institutions which govern the internet – rather than via any formalised central structure. In the video below you can watch the full launch press event which was also very internet. As alliance meetings are typically held via Google + Hangout it was appropriate to launch the campaign via the same means. In the room were representatives of several of the NZ organisations which launched the first Fair Deal campaign. TUANZ’s Paul Brislen was the MC, and representatives of the Royal NZ Foundation for the Bling, Creative Freedom Foundation ( Brownwyn Holloway Smith ), Consumer and NZ Rise ( Don Christie ) spoke first. Susan Chalmers attended from Geneva Switzerland were she is attending a policy meeting. Maira Sutton of the Electronic Freedom Foundation beamed in from Lima Peru where the latest round of TPP negotiations is currently underway. And Steve Anderson from Open Media Canada http://openmedia.ca, and Ellen Broad from Australia also participated remotely. Below you can watch the full video of the event in HD video via the ScoopIndependentNews youtube channel . The video is Creative Commons and available for re-use.